This interview by Christian Stache of Victor Wallis was Translated with permission from the October 6 2018 issue of the Berlin-based daily newspaper junge Welt (young World), which bears no responsibility for the English-language text. Christian Stache: Recently, a huge socio-ecological conflict escalated in the Hambach Forest in Germany. Have you heard about it in the US? Victor Wallis: It was not widely covered in the corporate media, but there was very good coverage on the independent Democracy Now! program, whose host, Amy Goodman, spent a week in and around Bonn during the recent international conference, and visited some of the occupiers in their tree-houses. Singer/songwriter David Rovics has just now posted a tribute, in narrative and song, to the forest-protectors and to the journalist Steffen Meyn who died tragically while attempting to cover their story. CS: How do you characterize the struggle? Are there decisive similarities with, for example, the battles against oil pipelines in North America? VW: It is a classic case of confrontation between a big corporation and people trying to save a priceless ecosystem. There is a definite parallel with the clashes in North America, including especially the more recent battle over the Dakota Access Pipeline, in which government forces intervened decisively on the side of the corporation. 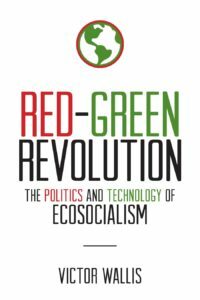 CS: You recently published Red-Green Revolution (Political Animal Press 2018) which has a special focus on ecosocialist politics. Can you explain what makes politics ecosocialist? How does it differ from the ecological politics, for example, of the Green Parties, the United Nations or the big environmental NGOs like Greenpeace? VW: Ecosocialist politics is based on recognizing that a sound ecological policy cannot be achieved within a capitalist framework. In order to restore (to the extent possible) the health of the ecosphere, it is necessary that economic decisions be no longer based on the capitalist goals of maximizing profit and accumulating wealth. They should instead be based on the common interest of humanity, which is bound up with the health of the natural environment. The only way to define what this common interest requires is through a thoroughly democratic process of informed public debate, adequately structured in such a way as to equip everyone with the necessary time, ability, encouragement, and information. (Time includes paid time at work; ability presupposes adequate universal education; encouragement depends on the organization and facilitation of discussions, allowing for differences between different individuals; information depends upon wide diffusion of pertinent facts and analyses, free of distortion by commercial interests.) An organization like Greenpeace does important educational work, but none of the organizations you refer to here have acknowledged the need to transform the framework within which economic decisions are arrived at. CS: What is the ecosocialist strategy and what are the tasks for ecosocialists in confrontations like the one in the Hambach Forest? 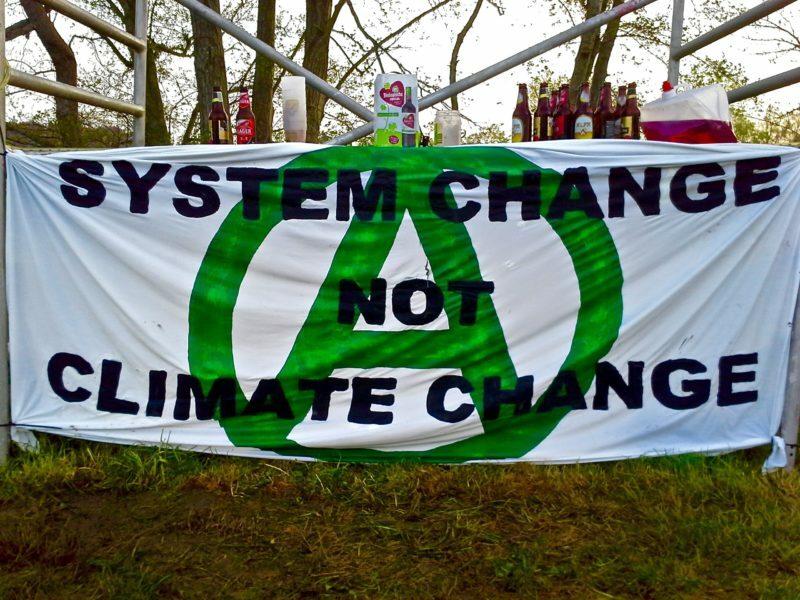 VW: There is no single “ecosocialist strategy” applicable to every struggle, but it is increasingly clear that nonviolent direct action such as that undertaken by the defenders of the forest is a vital part of the ecosocialist movement. Even if the resistance to a particular capitalist project is defeated, the actions that go into it – especially if they are filmed and if the video is widely diffused — can raise the general level of public awareness. These actions can thus help lay the groundwork for building the wider political force that will be necessary in order to displace the capitalist class from its position of power. CS: One focus of your work is the analysis and critique of “technology” and “progress”. Both concepts have become quite controversial. They are rightfully identified with ecological destruction and with the exploitation and oppression of humans in the service of capital. Why and how do you stick with these concepts? Don’t we also need new mechanical, organizational and social technologies to build an ecosocialist society? VW: I distinguish between capitalist “progress” and real progress. I put the capitalist version in quotation marks because it does not signify improvement of the human condition. In fact, in many ways it debases the condition of people as well as that of the natural environment. This has been recognized for a long time. Capitalist “progress” is narrowly goal-oriented, and the choice of economic targets is driven by competitive criteria which disregard the wider impact of a given production process or a given product. For example, the development and marketing of pesticides pays no attention to their general effects on species-life, including the lives of the workers who are charged with applying them. CS: And what about technology? VW: One cannot be “against technology”; even the most basic human pursuits, such as the production of food, involve technology at some level. The question that needs to be posed is: what is the basis on which a given technology will be selected for the achievement of a particular goal? You ask whether ecosocialism requires new technologies. If we speak in the narrow sense of physical devices, the answer is: not necessarily. Devices like bicycles and solar collectors already exist. But technology also has to be viewed in the broader sense of how space is allocated (e.g., between virgin land, cultivated land, and paved surfaces) and how production is organized. In this regard, it is certain that new approaches will be needed, although we should add that some of what is introduced may reflect the practices of earlier historical epochs (e.g., for preserving local biodiversity). CS: One central approach by the ruling class to avoid a real solution to the social and ecological questions at stake today and to revitalize capitalism is technological innovations. The German Ministry for Economic Affairs and Energy, for example, recently announced that they approved tests of the Carbon Capture and Storage (CSS) method by which CO2 emissions will be captured and stored in the ground. How is it possible to develop useful technologies and prevent them from becoming another “force of destruction,” as Marx and Engels put it? VW: Again, the precondition for this is to have full democratic discussion, as opposed to the decrees of capitalist enterprises. Such discussion is desirable not only for its psychological and motivational benefits, but also because it allows for the fullest possible exploration – free of concerns about competition or “trade secrets” – of all the consequences of a particular technological choice. As for taking carbon out of the atmosphere, a more promising approach than capitalist geo-engineering schemes is the approach of regenerative agriculture (see bio4climate.org). To apply this widely, however, would require rejecting the chemical-intensive, energy-intensive, and genetic engineering approaches of capitalist agribusiness. CS: Innovations of new technologies are one way to tackle environmental destruction without confronting its root causes. Are there other comparable strategies? VW: The two most important types of positive step that can be taken within a capitalist framework are 1) initiatives on the part of particular enterprises and 2) regulations or incentives established by governments. These two steps are somewhat interdependent, in that the enterprise initiatives – such as the use of solar technology – may be taken partly as a result of government policies (although they also reflect a certain sector of consumer demand). In the other direction, the government measures reflect in part the common interest of capital in preventing too severe a deterioration in the conditions – including public opinion – within which it must operate. However, the “good” steps taken by some enterprises do not put an end to the “bad” steps – such as fracking operations – that continue to be taken by others, and the few progressive measures that may be taken by one governing party may easily be reversed by a later one as is now happening in the US under the Trump administration. CS: In your book, you distance yourself from various positions on ecological politics which have gotten some support particularly among left liberals such as the so-called anti-catastrophist stance. What do anti-catastrophists stand for and why do you consider their standpoint to be incompatible with an ecosocialist project? VW: Anti-“catastrophists” argue that because of the urgency of the environmental crisis, we should prioritize policies that are acceptable within a capitalist framework. They claim falsely that advocating a socialist transformation means rejecting any near-term steps that fall short of socialism. No. Near-term steps are necessary, but they should be chosen and implemented as part of a strategy for radical transformation. The urgency of the crisis moreover creates conditions in which people can more easily understand the need for radical solutions. And, having a comprehensive or radical vision has the additional benefits of inspiring people with a positive goal and providing a framework for unifying various oppositional constituencies into a cohesive political force. CS: This sounds like a classic reformist critique of ecosocialism. But in what sense are they against catastrophism? VW: I put the word “catastrophism” in quotation marks because it is a derogatory term created by its users to denigrate those who argue, as I do, that the gravity of the crisis requires a radical or revolutionary response. The anti-“catastrophists” want to convey the idea that those who call capitalism into question, under present conditions, are driven by a kind of panic – leading them to set an unrealistic goal – and that reasonable people will therefore limit themselves to pursuing policies that can be implemented within a capitalist framework. CS: In Germany, a debate on “new class politics” has been going on for some time among Leftists. Until now, the purport is that the left should revive class politics but place them among struggles for democratic emancipation based on identity and difference. You argue the other way around. Why should we consider class politics to be the basis for collective organization and action without downgrading other struggles? VW: The basic reason for an overarching class politics is that this is what is imposed upon society by the capitalist class. 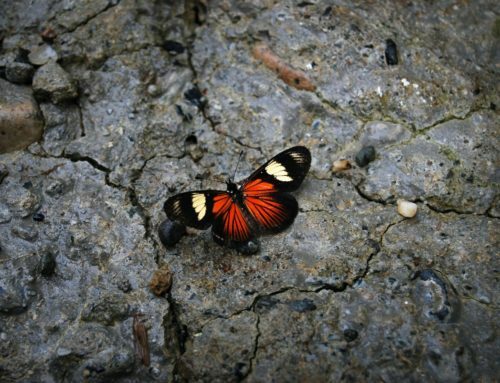 The capitalist class can diversify its political elite and its cultural icons in the dimensions of skin-color, gender, and sexual orientation, but this has no bearing on its acceptance of the major obstacle to environmental restoration, which is the capitalist organization of the production process. A more “diverse” ruling class is still a ruling class. CS: A central problem in the conflict over the Hambacher Forest is that the chairman of the works council (Betriebsrat) and the relevant union, the IG BCE (Industrial Union Mining, Chemistry, Energy), rather support RWE. Unfortunately, this is no isolated case. How is it possible to organize the working class to support protest and resistance against ecological destruction? VW: There are disagreements within the working class on such matters. The sectors that immediately support the capitalist/productivist/developmentalist approach are those whose jobs are tied to the particular capitalist projects. This is a worldwide problem. A successful response will not come quickly, but it will involve a combination of considerations. First, a much larger proportion of the working class is not in the position of the union that you refer to. Second, the projects that these unions endorse are typically short-term, meaning that the workers will have to seek other jobs when they are completed. Third, all these workers are at the same time part of a larger community, whose members, if suitably educated, can remind them that no one is immune to the long-term impact of environmental devastation. Finally, this raises the key question of conversion. The great task of winning over such sectors of the working class requires offering them a positive scenario, whereby they can envision as an alternative not unemployment, but rather employment in more beneficial projects, organized and managed collectively by themselves. Historically, such scenarios have often arisen in times of revolutionary ferment. CS: You propose an ecological and economic conversion program as a form of bridge between ecosocialist reform and revolution. What does such a project look like and is there a strategy of where to start? VW: If the project is to be effective, it will require strong leadership and coordination at every level of society. This will in turn require that power be in the hands of a political party that not only recognizes what needs to be done, but owes its ascension to a popular movement grounded in such understanding. This is indeed not easy to imagine happening. There is certainly no guarantee that it can occur. But with the further environmental disasters that are sure to come, people’s readiness to envisage radical goals – and act on them – may suddenly accelerate. The likelihood of this happening depends in part, of course, on the quality and the diffusion of the analyses that ecosocialists can put forward. In the meantime, significant preparatory steps may be taken on the basis of initiatives “from below”, such as forming cooperative enterprises and introducing methods of “regenerative agriculture” to draw carbon back into the soil and restore biodiversity at the local level. He is the author of the book Red-Green Revolution, published by this magazine’s parent company, Political Animal Press. Read more of Victor’s writings on Political Animal Magazine here. Political Animal is an open forum for smart and accessible discussions of all things political. Through our books, magazine, and our digital footprint, the views that we present will support and challenge your own opinions on a variety of subjects, both timely and timeless. We believe that what unites people is not agreement, but the need to discuss. Wherever your beliefs lie on the political spectrum, there is a place for you here. Our commitment is to quality, not party, and we invite all political animals to seize their voice with us.